Seeing Stars Well, here are a dozen beautiful stars for your September quilt project. Delicately stitched in beautful rayon, the sheen of the thread is what gives the star pattern its depth and dimension. The colors are a lovely shade of orchid (very pinky lavender) on snow white background. To complete the project, individual squares will be cut and joined. Quilting is decorated with delicate feather stitching. This project can be done by machine or by hand. 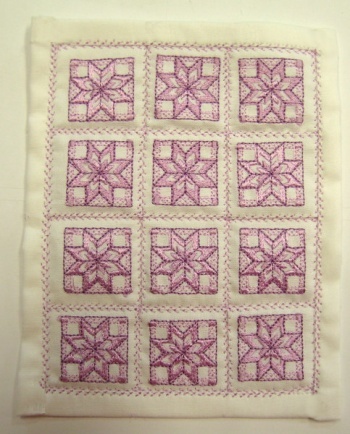 My sample was done on the machine, and a decorative feather stitch was used for the quilting. Finished quilt measures 4 3/4" x 6". Instructions for both machine and hand sewing will be given. Kits will ship July 15th so that they can be shipped together with July and October kits if desired. Online class is scheduled for September 11..